His best friend died trying to save him. 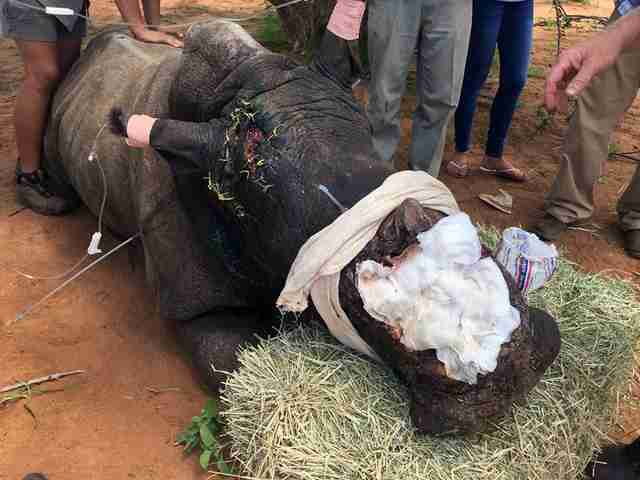 When the rescue team arrived, one rhino had already died, and the other was so badly injured they thought he'd probably die as well. 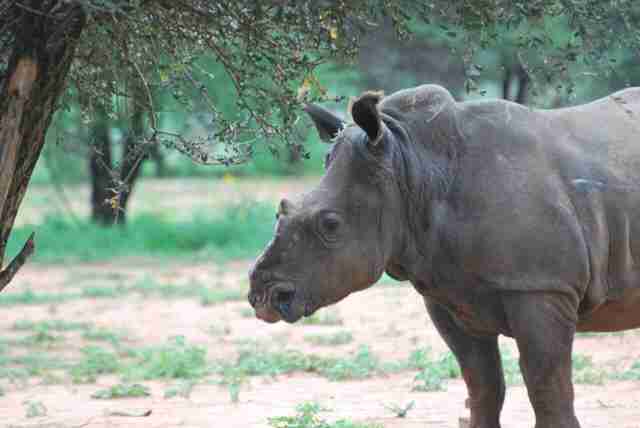 Vrystaat and Impi, both 2-year-old male rhinos, lived on a South African "farm" (the term for a privately owned game reserve) close to the Botswana border. Their farm had anti-poaching security, and Vrystaat and Impi lived right next to the owner's house. But when the owner was away one night, poachers found a way to move in. "They were either waiting or they were just opportunistic," Dr. Zoe Glyphis, a veterinarian for Saving the Survivors, an organization that provides emergency vet care for rhino poaching victims, told The Dodo. 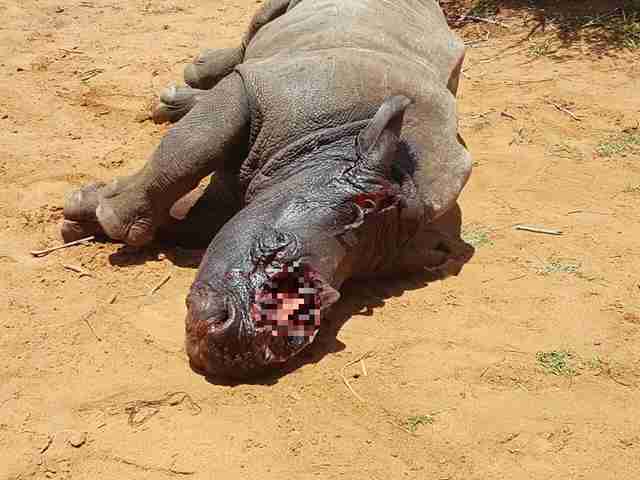 The poachers shot Vrystaat - once through the shoulder, and once through the eyes. Then they hacked off Vrystaat's tiny front horn, which they could sell for a large amount of money. Then they shot Impi through the abdomen, shattering his hip joint, but they didn't take his horns. "We think they shot Impi because he tried to protect Vrystaat," Dr. Glyphis said. Impy died from severe peritonitis, an inflammation of the tissue that lines the abdomen and abdominal organs, according to Dr. Glyphis. But Vrystaat had somehow - miraculously - survived. When the farm's owner returned the next morning and found the rhinos, he immediately contacted Saving the Survivors, asking for their help. A team that included Dr. Glyphis arrived as quickly as it could. "On arrival at the farm we were met with the lifeless body of little Impi," Dr. Glyphis said. "It is the most gut-wrenching and heartbreaking sight to see these animals and what they are subjected to." The team started treating Vrystaat immediately. Unfortunately, these kinds of attacks are far too common, especially in South Africa, which has the largest rhino population in the world. Last year, an estimated 1,100 rhinos were killed for their horns in South Africa alone, and 129 rhinos have already died this year. Poachers have even started targeting rhino orphanages - the very places that shelter the surviving babies of murdered rhino mothers. 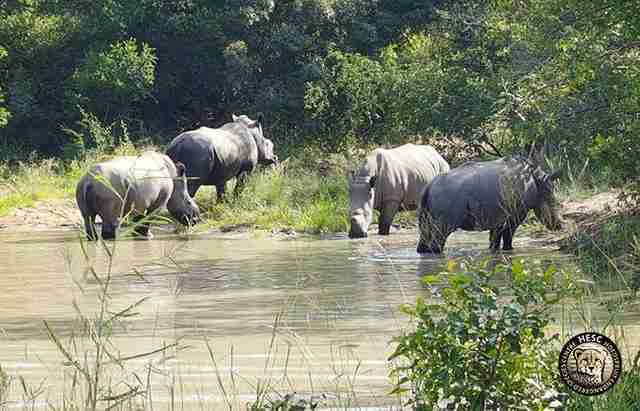 Earlier this week, two armed men stormed Thula Thula Rhino Orphanage and killed two baby rhinos, Gugu and Impy, despite the fact that they were both less than 18 months old. "Unfortunately poaching is rampant everywhere in South Africa," Dr. Glyphis said. "There are very few places that are safe anymore." No arrests have been made yet for the attack on Impi and Vrystaat. Vrystaat is not out of the woods yet, and he has a long road to recovery, Dr. Glyphis said. He'll require constant wound cleaning, specialized bandages and doses of anti-inflammatories and antibiotics over an 18-month period. Not surprisingly, Vrystaat doesn't trust people anymore. "From being a hand-raised calf who was accustomed to being around people, he has become completely distrusting of humans," Dr. Glyphis said. Yet Dr. Glyphis remains hopeful for Vrystaat's recovery. 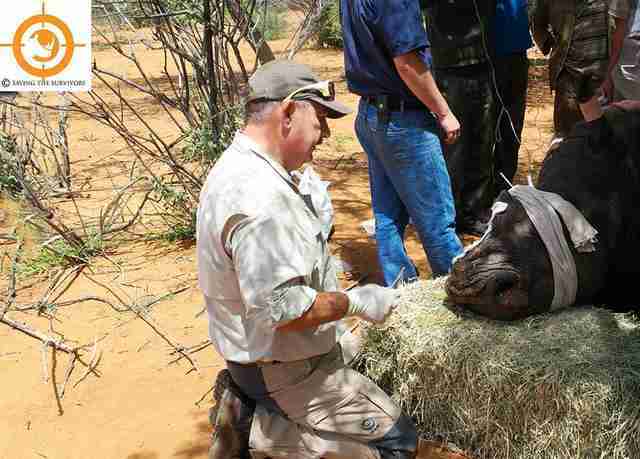 "Over the past few years we have seen a number of cases of rhino - black and white - that have been attacked in this way and they do tremendously well with the right care and treatment," Dr. Glyphis said. 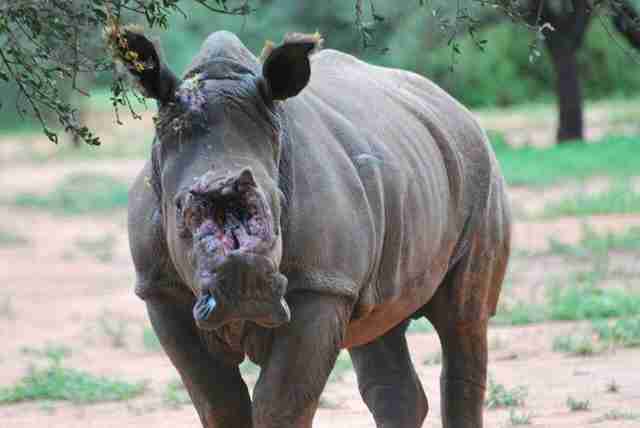 "I think every rhino we treat surprises us with their resilience and their will to live. 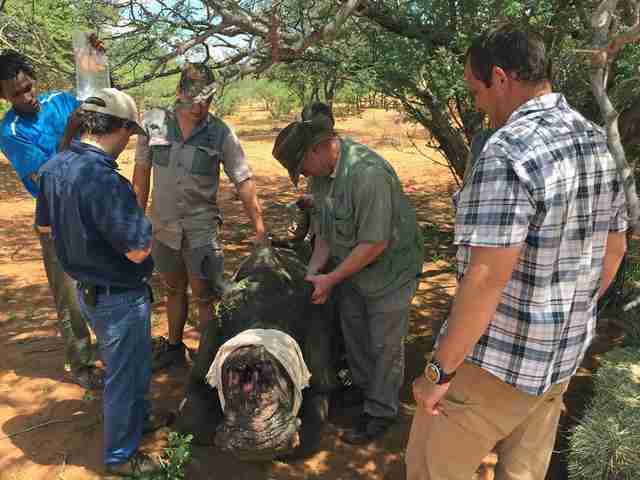 We can definitely attribute his [Vrystaat's] rate of healing to all the knowledge that we have gained from treating other rhino." 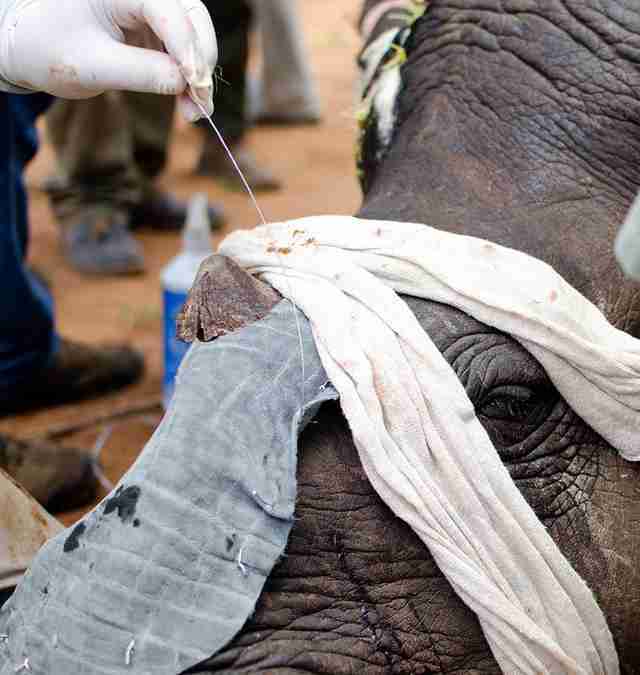 It will cost thousands of dollars to treat Vrystaat, Dr. Glyphis said, and there are always more rhinos to help. 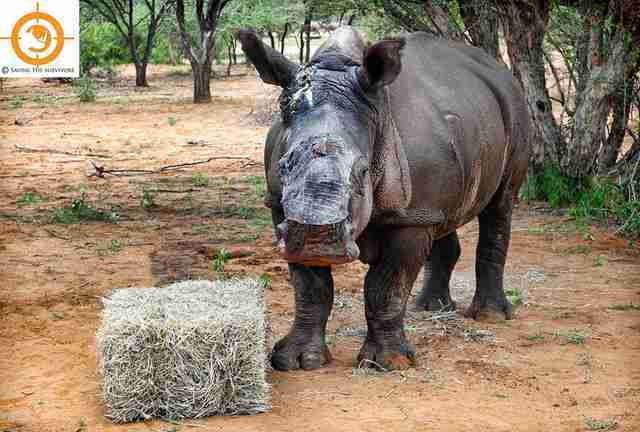 To help Vrystaat make a speedy recovery, and to help other rhinos, you can make a donation to Saving the Survivors. You can also follow the group's work on Facebook and Instagram.